Some people find cooking a chore and dread the thought of it – obviously, that is not us. We draw inspiration for cooking from a myriad of sources. From family and online friends, cooking shows on TV, recipe websites, cookbooks and food magazines to just rooting around in the kitchen needing to use up something. We love to cook and love to eat. Finding ideas is the easy part – trying to make them all is what’s difficult! The other day we were watching a show and they made homemade ravioli. Nothing unusual there – Victor makes homemade ravioli pretty regularly – but what made this different was they were using actual ravioli cutters – something we have never owned. 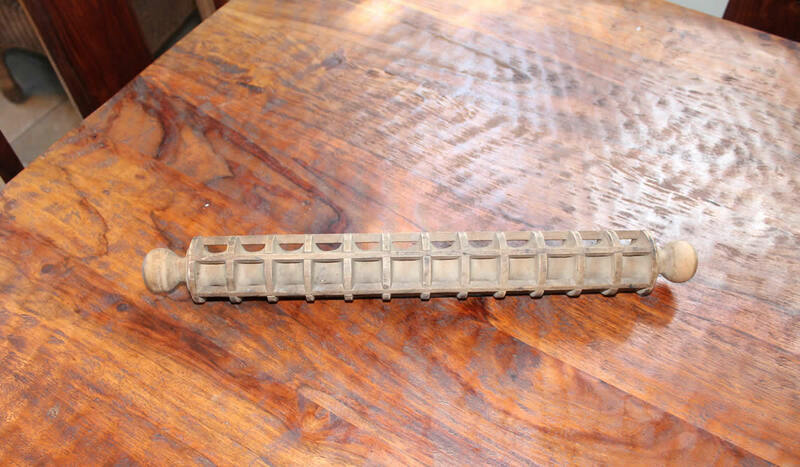 We have an ancient ravioli rolling pin, but it’s mainly for decoration, nowadays – there’s a crack along one side. While watching the show, Victor picked up his phone, and yesterday, we had ravioli cutters delivered to the house. That, of course, meant we – as in Victor – needed to use them right away! He decided he was going with a really basic pasta and sauce – with a basic cheese filling. A classic ravioli. And then he decided he would play with the dough a bit and infuse some fresh basil leaves into it! This is actually a pretty easy process but it really is cool as hell! It’s like finding fossils in your dough! Create well on board with flour and salt. Mix eggs and oil together and pour into center. Slowly incorporate flour into eggs. When it has all come together, knead on board for about 10 minutes or until it is smooth and elastic. Wrap dough and let sit for about 30 minutes to relax. Cut dough in fourths and, one at a time, send through pasta roller. To embed the basil, after rolling a few times. place fresh leaves on half of the dough and fold the other half over to completely cover them. Continue to roll dough through machine, reducing the thickness as you normally do. 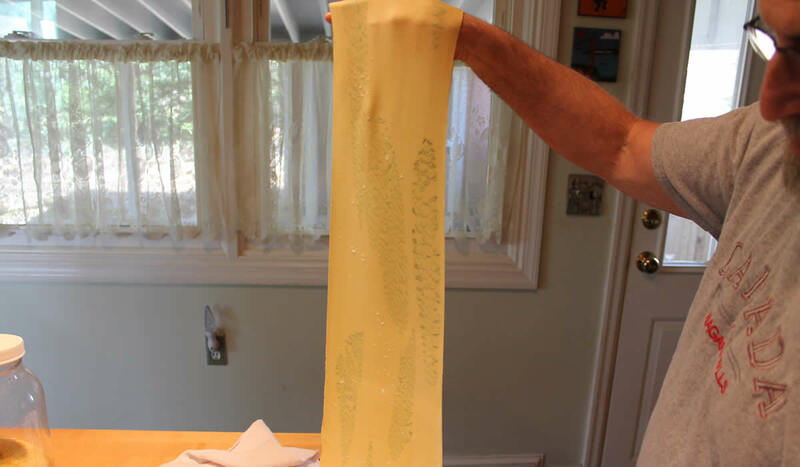 Place pasta sheet on counter and spray with water. Place tablespoons of filling on dough and then cover with a second sheet. 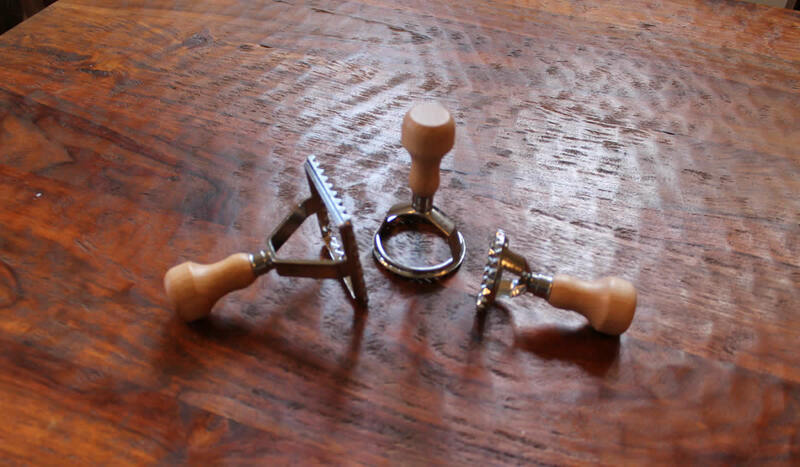 Use a ravioli cutter – or crimped cutter or knife to cut ravioli into desired sizes or shapes. Cook in barely boiling water for 3-4 minutes or until done. The sauce was a jar of Victor’s homemade sauce and roasted red pepper sausage. The ravioli were light as a feather – the dough was thin – not the belly bomb that so many ravioli can be. The sauce, of course, was perfect – he has that down to a blindfolded science – and he added some fried hot peppers to the sausages at the last minute just to add some interest. A quarter of the dough made 16 large ravioli – the rest was portioned and put into the freezer for a later date. We ate six each and Blanche will get the rest as after dinner treats. Yes, our dog is spoiled. I would have eaten more but tomorrow is weigh-in day. One must be good.